For every cyclist, it is an issue to find the correct and fitting bike wear. Bike wear is not only supposed to look good, no, it also must really deliver. High-quality bike wear from leading brands, such as Gore Bike Wear, Assos, Specialized nowadays is no longer only breathable, windproof or waterproof. Using high-tech materials, the clothing for cycling performs more than you could have imagined decades ago. Whether it is the bike jersey, the cycling tights or shorts or the rain jacket, nowadays the perfect fit and wearing comfort are basic requirements. After all, bike wear is not always a very favourable investment, but whoever wants high-quality and functional bike wear, will appreciate the price of the premium brands. If you are looking for cool bike wear online, of course with stylish designs, and what's more, you do not want to forgo the perfect wearing comfort and performance, then, you should browse through our shop under the hot brands, such as Qloom, Zimtstern or ION. They do not only look good, but they combine functional clothing with cool features, such as integrated lens cleaning cloths or waterproof handy storage space. But it does not always have to be expensive! 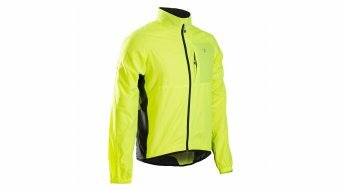 At this large selection of bike wear, you may sometimes be able to make a quick bargain without any further ado since we are constantly offering great inexpensive bike wear at best prices due to sales push campaigns, clearance sales or changing collections! Depending on the weather and the season, all of these items are available in different fabrics and layers, also suitable for spring/autumn, summer or winter. The safety aspect may in no case be neglected. Here, the helmet comes into play. Without any question, it is vitally important! No matter how intensely you exercise your cycling, it has to be part of your basic equipment in any case! Protector clothes / protective equipment will become interesting and necessary if you are more downhill oriented and a trail enthusiast. Our tip: There are two blog articles which could be very interesting for you in this regard. Once you have equipped yourself (not necessarily less expensive) with good bike wear for wind & weather, you wish to enjoy everything for a long time. Here, you can make some mistakes in terms of care and washing. Sylvia explains in our HIBIKE blog (in German) what you should absolutely pay attention to when washing sports wear. And Laura's blog article (in German) shows you how you dress perfectly for cycling at colder temperatures by explaining the layering principle. HIBIKE blog posting deals with "How to take care of functional clothing"
HIBIKE blog posting "Correct apparel for bad weather conditions"
Apart from the actual bike wear as well as the bike underwear selected compatible to the temperature, you should also consider bike shoes, bike gloves and further necessary items. E. g. a pair of glasses. It protects you not only against the sun and UV rays, but it also protects your eyes against dirt and insects! Top supplements are also arm warmers, leg warmers or knee warmers, other protection from the cold such as base-layer balaclavas and accessories.